At an event for the press ahead of this week’s New York Auto Show, the new Scion iA sedan made its world debut. What we didn’t know until just before the car’s unveiling, however, was that for subcompact-loving Canadians the Japanese automaker would opt to badge this new sedan a Toyota Yaris in the Great White North. (With the small car segment in Canada and especially in Quebec thriving, Toyota’s Yaris has been a key player in that market). The new 2016 Toyota Yaris sedan arrives at dealerships later this year, and features a 106-horsepower, 1.5-litre four-cylinder engine with both six-speed manual and automatic transmission options. Standard-equipped features are plenty, and include power-adjustable heated exterior mirrors, keyless entry, cruise control, power windows and power door locks. 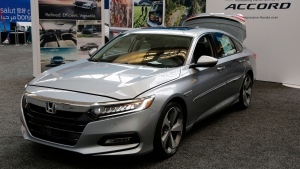 Design-wise, the sedan’s front-end features sharp-eyed headlights and a prominent, rather large hexagonal lower grille, while its spacious rear cargo area and 60/40 split rear-folding seating provides interior versatility. Fuel economy, other full specs, and Canadian pricing won’t be announced until closer to its availability here, but Toyota has said that the single-spec Scion iA variant will be priced competitively at around $16,000 in the U.S. The Yaris/iA sedan unveil was held alongside the debut of the all-new Scion iM hatchback, which will be sold in both Canada and the U.S. as a Scion iM.